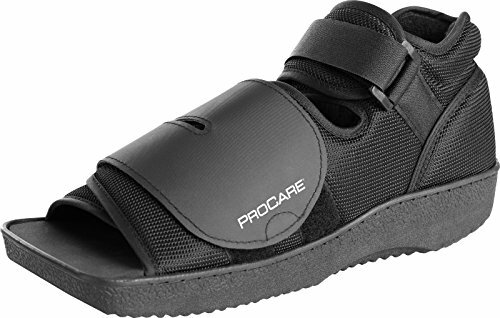 The ProCare Squared Toe Post-Op Shoe allows the dressing to be kept clean and toes dry, providing stable protection following post-operative procedures and forefoot trauma. The square toe design acts as a bumper and provides additional room and comfort for your foot. The shoe also features high ankle strapping that maintains your foot in proper position. A rigid rocker sole allows for ease of ambulation and pressure reduction. Universal fit allows the ProCare Squared Toe Post-Op Shoe to be worn on either the left or right foot. Note: Refer sizing chart before ordering the item.